You will agree with me, that to have a pool means to have everyday joy during the summer season. Swimming is that kind of exercises that help to keep your body especially back and legs, in perfect strength. The only problem that can occur with private pool is its proper maintenance. To clean it and keep the water safe for the health, you will need special knowledge and appropriate tools. Those are filters and cleaners, tools for setting them up and, of course, information on how to do it right. So, the modern market is full of different appliances that can provide more or less efficient cleaning of both in-ground and on-ground pools. In this article, we will observe the most exciting models of automatic pool cleaners. 1 What is a pool cleaner? Before we go deep in the reviews, let us make a short acquaintance with the device. A pool cleaner is an autonomous appliance that works in the same with vacuum cleaner logic. It means that the device collects the dirt and debris that sink in the pool into a special bag. There are three types of pool cleaners: these which work using the suction power; those of pressure pumps; and those of autonomous electric robots. All these types have their advantages and disadvantages which we will discuss in our next article, and here let us overview the best pool cleaner models worth to buy in 2019 before the season starts. As the name suggests, Polaris 380 is a pool cleaner of pressure-side type. It means that to its proper work it needs a booster pump like Polaris PB4 60. The device is designed for every kind of in-ground pools and besides the size of the pool doesn’t matter. It can clean the pools of different size and shapes. Polaris 380 has several exciting features that can make you want it. The first is the technology of the belt-drive system, and iconic three-wheeled design allows the device to travel through the surface of the pool sweeping, vacuuming and scrubbing the floor and walls as deep as the seams between the tiles allow. The other important feature of the Polaris 380 is its filter bag. The size of the bag and technology it works with provides efficient dirt collecting during the whole cycle of cleaning. It means that you will not need to empty and maintain the filter bag very often, as well as you can be sure that there won’t be a single particle of dirt that the device misses. Polaris 360 is very similar to the Polaris 380 but has one but the key difference. Polaris 360 does not need a booster pump for efficient work. The appliance works with all types of in-ground pools, but in contrast with the 380 model, it connects to the common pressure line and is powered by the pressure of the clean water running through the pump. Polaris 360 has a similar to the 380 model design with wheels and triple-jet system. It provides deep cleaning of the pool surface, including floor, stairs, walls, and seams between the tiles. The device has a useful filter bag and a large opening for big debris, so, you can be sure that all the dirt sink in your pool will be collected in the bag, including leaves and branches. The ability to work with the common pressure line of the pool make the price of Polaris 360 higher than the price of the models that require the separate pump, but regarding the cost of the pump, it is profitable to purchase the 360 model. Dolphin Premier is one of the best in-ground pool cleaners in the market. It is a robotic device that works autonomously and needs no human participation. The appliance works perfectly in the in-ground pools of the most common materials, like vinyl, fiberglass, or plaster. Dolphin Premier is a pool cleaner of the high price level, so, it offers some excellent functions. 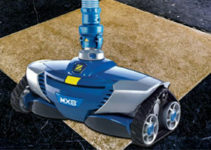 The most important its feature is powerful ultra-efficient twin DC Motors and scrubbing brushes. The device also has intelligent navigation with the help of smart sensors allows the pool cleaner to move through the surface of the pool. Due to its navigation Dolphin Premier can clean not only the floor of the pool but also stairs, walls, and a water line of the pool. Dolphin Premier can collect all types of debris from thanks to its unique cartridge system that includes cartridges for micro-trash, regular trash, and over-sized trash. unique cleaning technology of all-sized debris. Aquabot Elite is a robotic pool cleaner for all types of the in-ground pools. Although the device stays in one line with Dolphin Premier, it is a bit cheaper and provides almost the same functions. Thanks to its massive cartridge system it efficiently cleans all types of the debris including microparticles that sank in the pool. Aquabot Elite has a complete suite of sensors that make its navigation through the pool more intelligent than the other pool cleaners have. The sensors allow the device to detect the debris, strains and large trash not only at the bottom of the pool but also on the walls, stairs, and the water line. Another essential thing about this pool cleaner is its powerful motor which, however, stays an energy-friendly because of its DC compatibility. When speaking about the cons, we can only name its price in comparison with more affordable models. But when we talk about the pool cleaners at the high price level, the price is very soft and pleasant. Haward Tigershark is a robotic pool cleaner that uses the microprocessor-based technology. The device does not require a boost pump, for it works separately; it has a roller brush of high efficacy that scrubs the floor and sides of the swimming pool. Although the Tiger Shark is a robotic device, it has no remote control, so, you won’t be able manually to start or stop the device. Haward Tigershark is a robotic microprocessor-based pool cleaner without remote control. It has a powerful 24-volt motor that makes it an energy-friendly and safe device. The main roller brush is located on the front side of the appliance, so it scrubs the floor and walls quite efficiently. The massive cartridge technology allows the device to collect all-sized trash, including micro-particles. covers total pool square including the walls. In this article, we observed the most notable and exciting models of pool cleaners that are worth to buy in 2019 before the swimming season starts. The devices are of different price-level, but if you are not strict in budget consider the robotic appliances for your swimming pool. They mostly save your time and nerves during the cleaning process and do their job as best as it’s possible. Automated pool cleaner – general information about pool cleaners and types. How to clean a swimming pool – excellent video review in which a man developed a pool cleaning routine which seems to work well. Polaris 360 vs 380 Comparison Review – very good comparison review about popular pool cleaner.